The weekend is fast approaching! Hope you’re having a lovely Friday. Our sceencap today comes to us from jazzbaby1 who has her own music and poetry blog: FunkyBlueDandelion. She chose an image of Richard Armitage as Ricky Deeming from George Gently. Jazzbaby1 also recommended the song “Hot, Hot Papa” sung by David Wilcox. Thanks so much, jazzbaby1! I clipped out the second figure, darkened it a bit and added a drop shadow. As an experiment, I duplicated this layer and added a SpinRadialBlur and Motion Blur. I often try things out that don’t work and then I undo them, but this time I liked the additional effect. Finally I added the text “RIVETING” using the AR DESTINE font with the Drop Shadow and Satin effects applied. The song was a really great fit for the Ricky Deeming character! If you had a motorcycle and lots of riding lessons with Ricky Deeming, where would you ride? 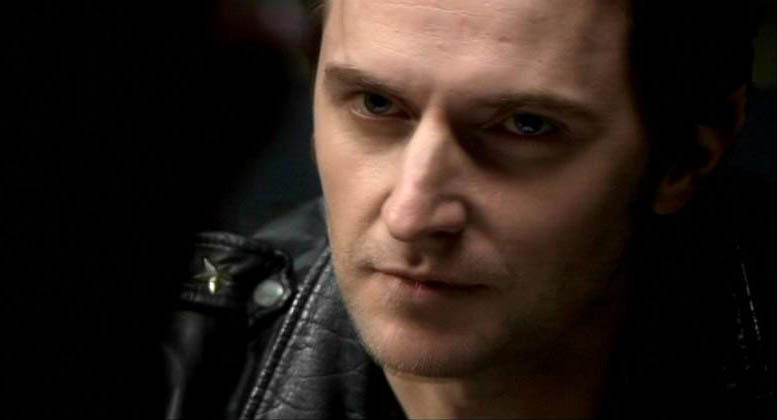 This entry was posted in Collaborative Project, Graphics, richard armitage and tagged actor, david wilcox, george gently, graphic a day in may, graphics, hot papa, leather, richard armitage, richardarmitagenet, richardarmitagenet.com, richardarmitagenetdotcom, ricky deeming. Bookmark the permalink. I’m off to work today singing “Hot,Hot, Papa”….a graphic that is as dynamic as Ricky – love it Bccmee and thank you jazzbaby1 for the great song and for picking Ricky Deeming. Don’t know if I would ride in that motorcycle – don’t want Ricky to have an accident. But he better watch out, I might steal that white scarf! All that movement reminds me of my favourite Futurist painting Dynamism of a Dog on a Leash by Giacomo Balla. Wow!! I love Ricky Deeming …. what a great siggy Bccmee!! Well done. This whole package is perfect, the siggie and the song!!!! Great choices jazzy and bccmee!!!! Wow, what a great sig, B! Glad you liked the song, too! @jazzbaby1: I really did like your song and screencap choices! Thanks so much for your contriutions! I’ve been picking up some cool new music through this project. Love the siggie and the song too. I’m not a big fan of motorcycles, but if I was riding with Ricky in front of me, I wouldn’t care where we went. Kudos to you and Jazzy for your siggie with her image choice! I love the blur. The blur for me is evocative of motion, tension, and the discontent that is at Ricky Deeming’s core. Here was yet another of Richard Armitage’s layered character portrayals in which he transformed what could have been a stereotypical “hood” character into full multidimensional reality. Nice! I love the blurring effect! Ah, RA looks soooo nice in leather. Hi Bcc, There are so many new songs with your project! And as always your amazing talent! Great choice of picture and music ladies! Ricky is indeed a hot, hot papa as Bcc so well illustrates. As for the trip, I don’t know about riding a motorcycle by myself. I think I would be required to ride on the back if Ricky’s. We would head out west and visit all the well known and lesser known national parks. On the way back we would stop in a diner in Wyoming and find Hot, Hot Papa on the jukebox and dance to it. Ricky’s time was my teenage heyday, and I had my own bike (not a Norton, but my then boyfriend had one which I did ride…very heavy! )……I sold my last bike in 1987. RA on a bike would be a dream, and we’d go to the Isle of Man and ride the TT course……..where else! What a great match with pic and music jazzbaby! Love the siggie, bcc. Thankyou for continuing with your explanations, I’m taking notes now that I have the software! Fab pic & music Jazzbaby 🙂 Amazing graphic Bccmee – riveting indeed! If I was riding with Ricky I would want to be on the back of the bike pressed up tight against him – then it would be hot hot Mama me! Talking of blokes in leather on bikes…….. .
@Everyone: Wow, you have such great ideas for where to go on a road trip with Ricky! Riding behind him sounds rather pleasant, hehe. Maybe he’ll loan you his white scarf if you get chilled. “Riding with Ricky” sounds like it could be a documentary style reality show. I’d tune in for sure and would mail a postcard if that would mean a chance to join him in an episode. 😉 I love the idea of stopping at a diner and playing “Hot, Hot Papa” on the jukeox and then again through earbuds for a soundtrack while riding. Wow, I love the art of Gicamoa Balla with the sense of motion! Great song by Blur even though the reference to the name of the band was lost on me at first since I was intrigued by the font! 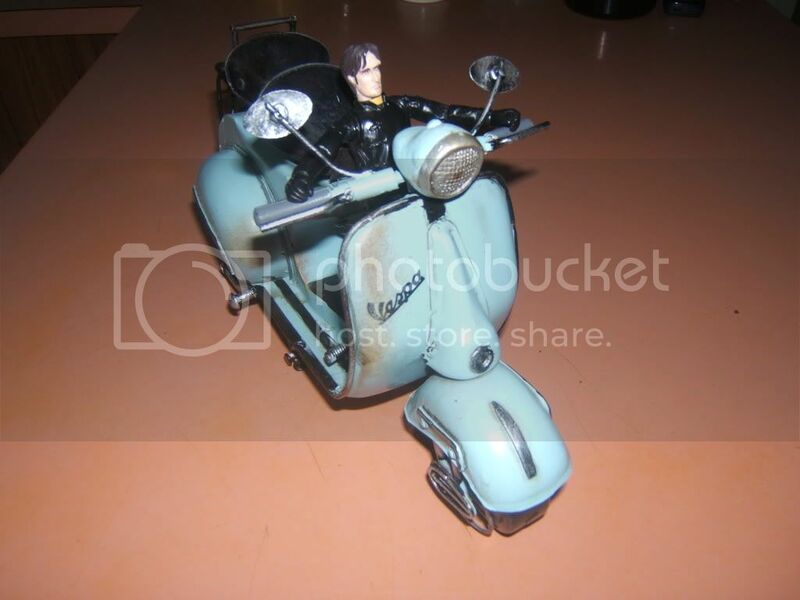 LOL re: Little Guy on a Vespa! Do you think he could keep up with Ricky Deeming?